Happy New Year to all our friends, partners and supporters! 2015 saw the Trust continue to develop more projects, employ more staff and reach out to larger community base. We couldn't have achieved this without the support of our major donors and the hard work put in by our management and field teams. We have improved monitoring and data collection by rolling out the SMART system with our main patrol teams and will continue training our men and fine tuning the application for our needs. Our community tree planting efforts continue to exceed the results of previous years and our community health project is in now its second year. 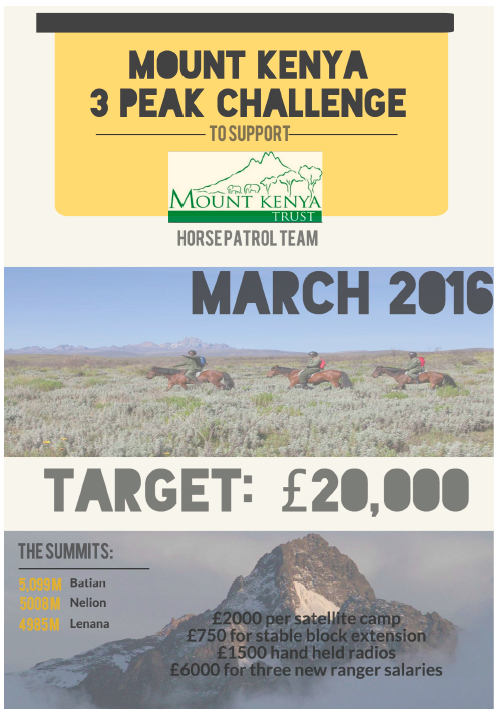 Elephant poaching on Mount Kenya has been reduced by around 80% in the last 2-3 years. 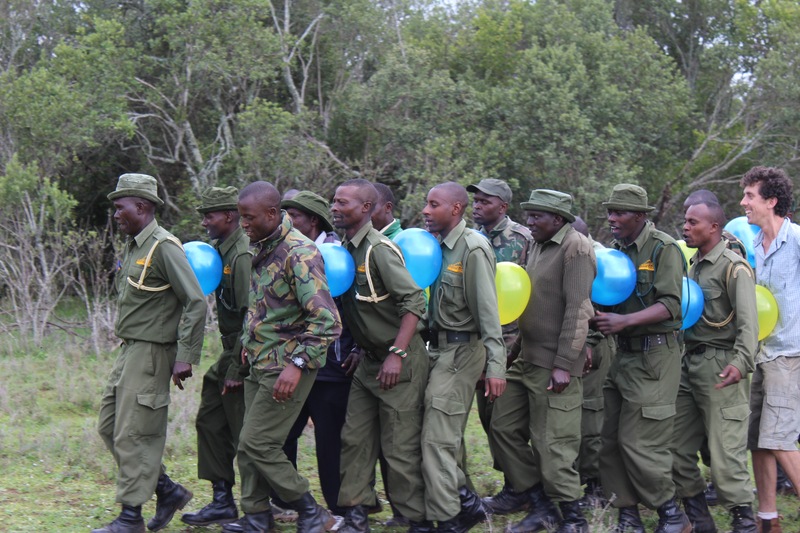 This is thanks to dedicated anti-poaching work of KWS on Mount Kenya and the Senior Warden in particular. 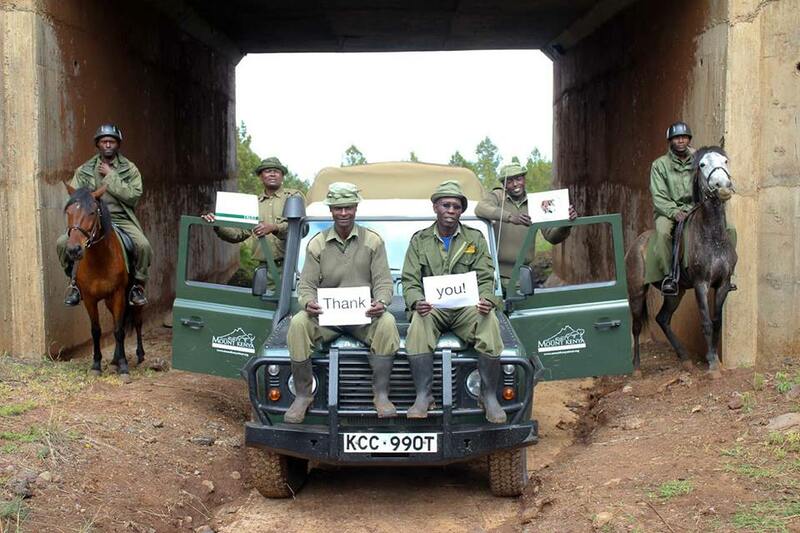 These commendable efforts have been supported by direct contributions to KWS in terms of resources such as fuel and support for KWS intelligence by the Mount Kenya Trust and Rhino Ark and our MKT patrol teams who work in tandem with KWS at all times. 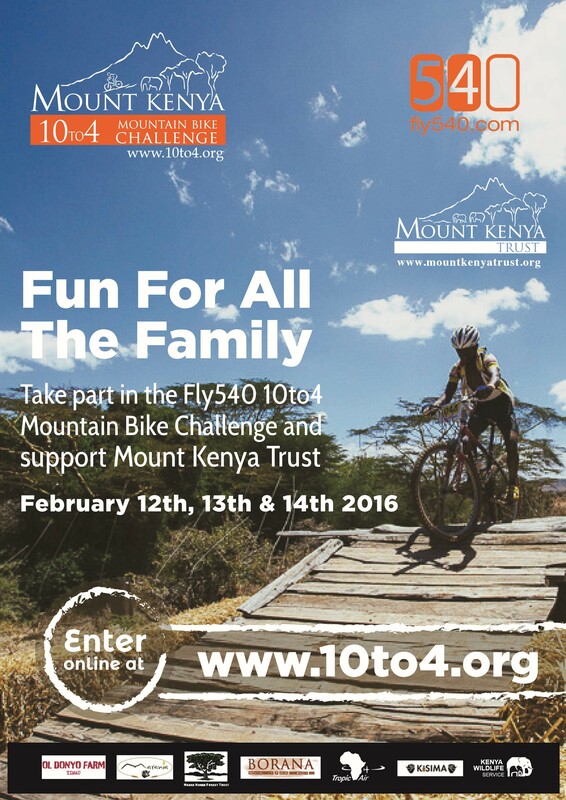 We hope you will be participating in this year's FLY 540 10to4 Mountain Bike Challenge, it's a fantastic way to contribute to our cause while having an unbeatable weekend with family and friends. It's not too late to enter! We wish you all a safe, happy and GREENLY responsible 2016. Check out the horse profiles on the blog by Cielle Vaughan. All teams are now using SMART - data collection by entering patrols straight into a phone. Click here for more info. Spaces for 10to4 are filling up fast - book your place here. Problem Animal Control has been a big focus for the JWPT with the team driving crop raiding elephants back into the forest in September. Several sheep were also killed by a pack of stray dogs which caused havoc in the local community. Around their base at Ruthumbi Forest Station, excessive and illegal resource extraction remain. During October the team made 11 arrests (at 5 incidents), recorded 11 incidents of logging, cleared 18 snares (including elephant designed snares), destroyed one pit trap and four illegal marijuana plantations. 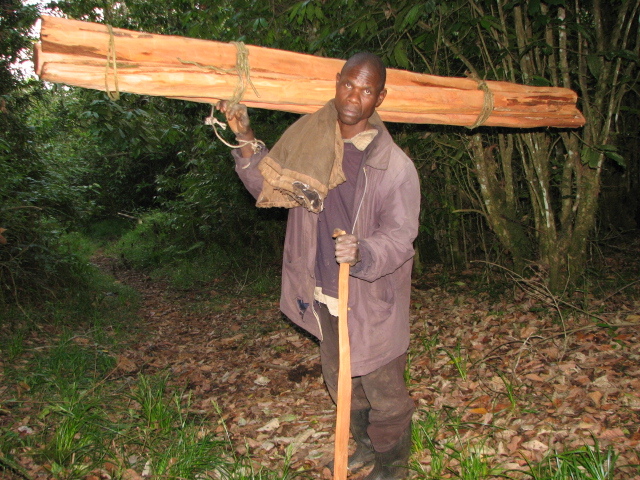 The logging within the forest boundary remains ominous including threatened species such as the camphor and red cedar trees felled for posts. During November when there was a huge amount of rainfall so human incursions reduced but the team continued their work, making another five arrests, recording 16 incidents of logging (2 related to charcoal production) and cleared further snare set for elephants. The team were also pleased to see the MK Comprehensive Fence Project arriving in the area. 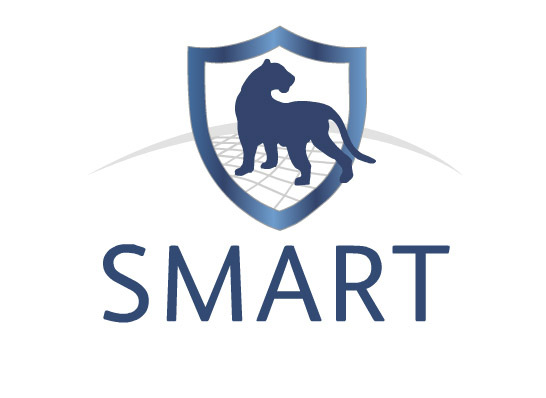 HPT have been the first team to adopt SMART - the new data collection tool which uses a basic Samsung smartphone app to input GPS patrol data. 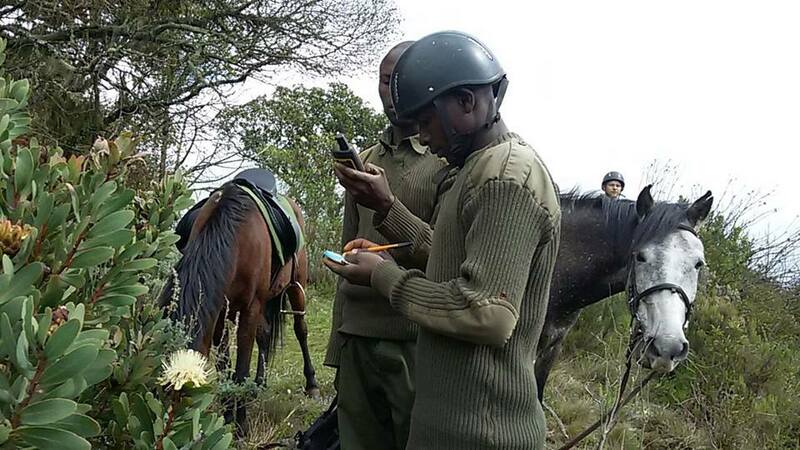 The app, known as Cybertracker, gives options such as 'logging', 'snare' or 'poaching' with extra details added by the team. The team identified several accounts of illegal honey collection and undertook a de-snaring operation accompanied by the Kisima Farm security team, with an entrapped Kisima horse. Nine small and medium sized snares were cleared, one of which was set along the Embori Farm perimeter fence. 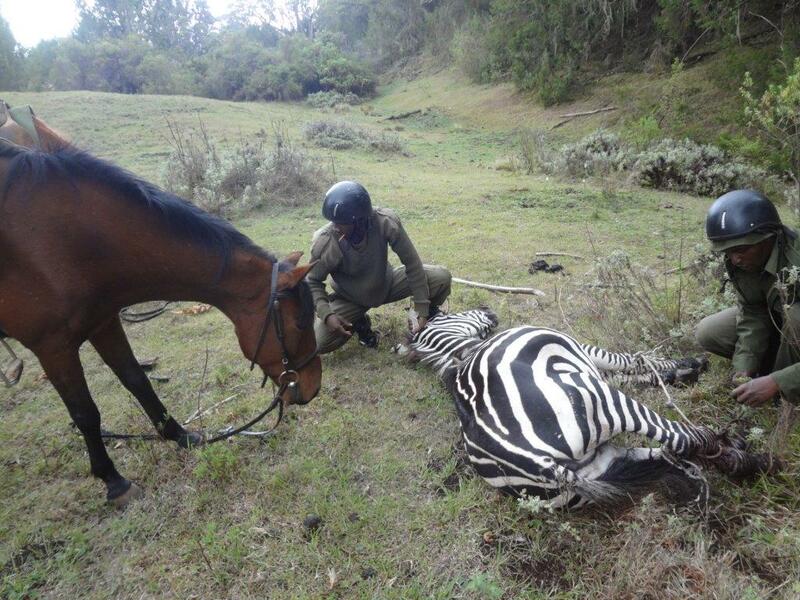 They also rescued an injured zebra that had been caught in a snare - freeing him in daring operation! Throughout November and December, the team were joined by Ceille Vaughan. She gave the team advanced riding advice and trained one of the newest team member how to ride! Read about her experience here. 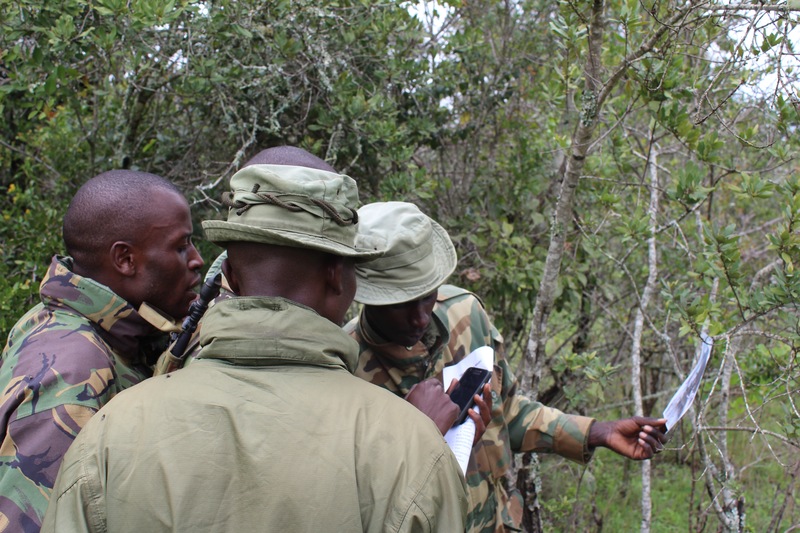 Patrols have been focussed within and toward the Southern end of the Elephant Corridor. Here the MWG were monitoring the recent PELIS (Plantation Establishment and Livelihood Improvement System) developments to ensure that community members farming in these areas were not conducting illegal activities. They also kept a close eye on elephant activities and noted that the heavy rains that started in mid-October spurred the elephants to start their downhill journeys. Heavy densities of unpermitted livestock were also reported. During the course of their normal patrols they regularly sighted the small pack of African Wild Dogs who now use the corridor to regularly travel up and down from their usual home range across the Borana and Lolldaiga Conservancies. Carcasses of a serval cat and mongoose hit by a car on the D481 road (which crosses the Corridor between Marania Farm and Ntirimiti community) further emphasises the need for a second underpass. Snares, charcoal kilns and poacher's camps were also destroyed. Humphrey Munene - 16 years of dedication! Humphrey started working for the Trust over in the year 2000 and has been the backbone of the Trust ever since. 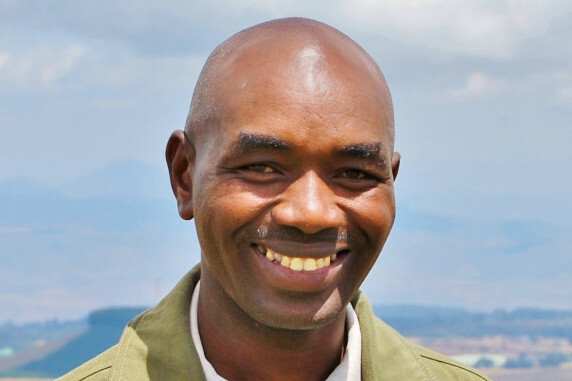 His green fingers have played a key role in nearly all of MKT projects: reforesting large bands of degraded land, installing over 100km of two-strand fence on the Northern and Western side of the mountain and educating thousands of young school children on conservation issues. With so much experience and a myriad of contacts in the area, Humphrey is an invaluable asset to the smooth, diplomatic running of all projects. 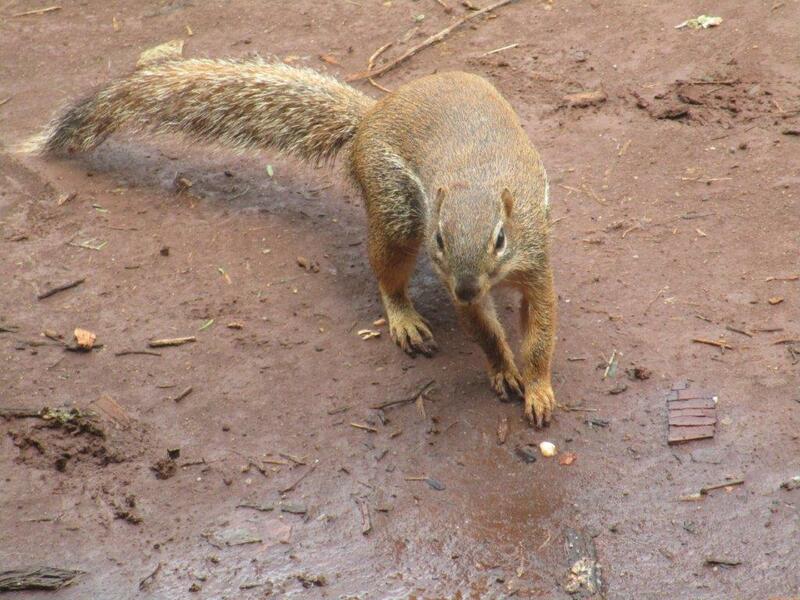 He knows whom to talk to first when a new reforestation programme is started. But it took him time to earn the trust of the community. 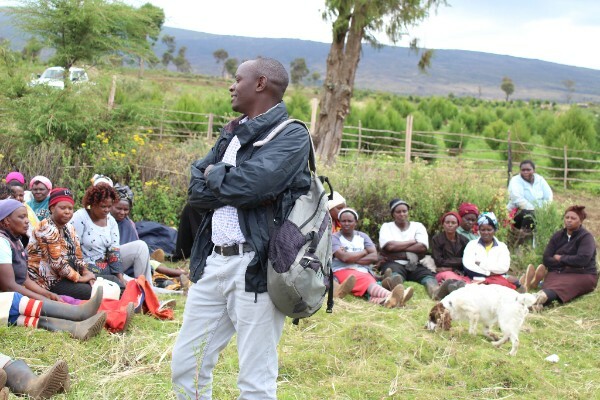 Seeing conservation projects succeed over the past decade gives Humphrey confidence that the biodiversity and habitats of Mount Kenya will not be lost. Although, some things he notes, do take generations. Karuri planting has been very successful with high survival rate recorded using the KFS PELIS. The survival rate for the last planting season are also expected to be high too due to the good rains. Over 17,000 assorted tree seedlings were planted this season, approximately 17Ha of the site. We are now ahead of the game with all of the plots now planted. The next step is for KFS to mark out another area that will be put under cultivation hopefully in the new year. However the planting does not come without challenges. Exotic Vs Indigenous habitat restoration is a contentious issue within the community due to the perceptions of direct and immediate benefit from the forest. The absence of a forest guard in the area also hindered the coordination of seedling delivery and planting, however the forester in charge worked hard to iron out the issues. The rehabilitation area atIrangi received good rains and the women group members had done pitting well in advance to enhance water saturation. This is important due to the fact that planting on the site is on uncultivated ground since there is no PELIS programme in the area. Three different species namely; Syzygium guinensee, Podocarpus latifolia, Podo afrocurpus were transported and planted by the Wamiti and Magacha women groups. A total of 5000 tree seedlings were planted out of which 1500 replaced dead seedlings planted in October last year. The rest were planted in a new site. Some 1000 seedlings were also transported from Brackenhurst in early December. A new tree nursery is to be built at Sirimon School with a generous donation from Bunson Travel in Nairobi. Equipment such as a wheelbarrow, water tank and watering cans have also been provided to get the nursery up and running. The school has an experienced groundskeeper who pays careful attention to the seed beds with hundreds of African Olive seedlings coming through ready to be planted into propagation bags. We have high hopes for the nursery once it is built - great job Sirimon! 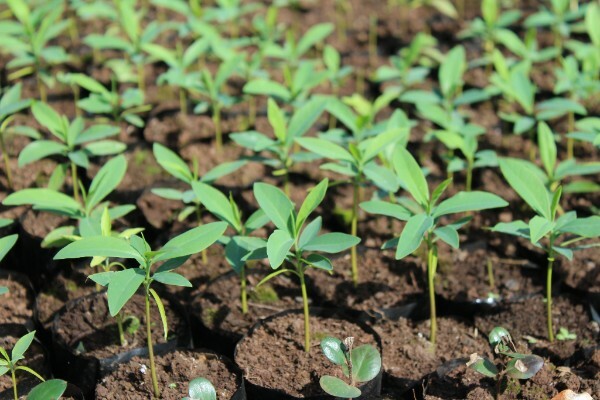 Over 5000 tree seedlings are growing their way up in the MKT 10to4 tree nursery. These include species such as the Pencil Cedar, African Olive, Sandal Olive and Yellow Fever. We hope to have seedlings ready for planting in our reforestation projects and selling at places such as One Stop in the new year. 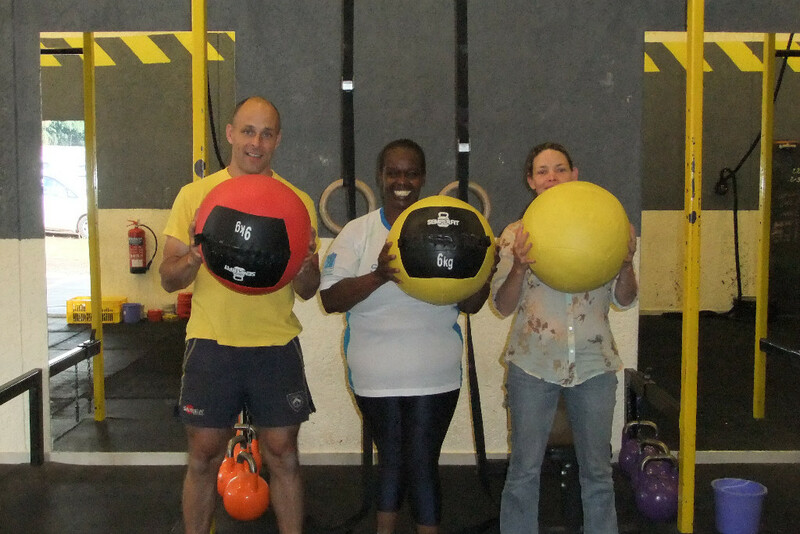 A huge thank you to Christine Nyawira for your 150 wall ball challenge raising over 30,000KES towards tree planting projects. This was her first event for her year-long challenge to raise funds for the Trust projects. Watch this space for the next! 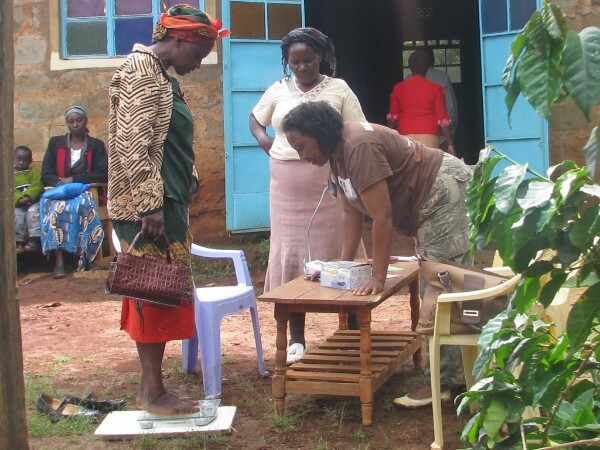 The health project kicked off again in October, with two week long clinics per month in Meru and Embu county. 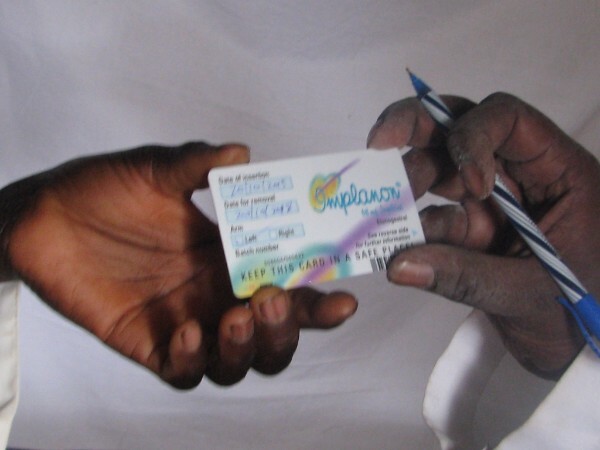 For October and November almost 2000 patients came to the clinic for family planning services. Over 150 people were counselled and tested for HIV with 3 positive cases referred to the local hospital. Nearly 500 patients were seen for curative care and over 100 men and women screened for cervical and prostate cancer. Of these, 20 were positive and sent for further tests. Thank you CHASE UK for providing funding for another year for this crucial aspect of conservation. 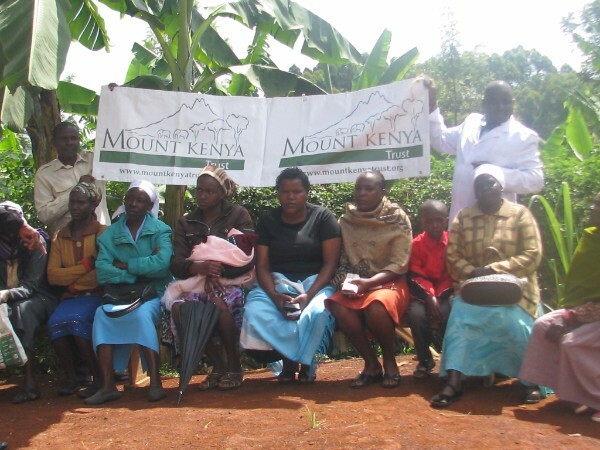 Population growth is a complex yet sensitive aspect of Mount Kenya conservation and the clinics are well received within the communities. The mobilisers, who are part of the communities they work within, are respected and trusted and this helps to deliver the contraceptive and health message in an unassuming yet community-driven way. A brand new Land Rover Defender was generously donated to the Trust from DWST. The corridor and its environs have long suffered from a lack of a dedicated vehicle and hampered our ability to respond to emergency situations, such as arrests and the rescue of the orphaned elephant Sirimon. The new vehicle will greatly assist in the running of the corridor in particular regard to the deployment and support of security and fencing teams. The vehicle will operate from theKimiti outpost in the centre of the corridor, where the MKTâ€™s northern area coordinator is based. Putting up a fence is the easy part but maintaining it from the determined elephants, traffic accidents or illegal access is a full-time job. In September five elephants entered the corridor by breaking one of the corridor perimeter fences, after travelling many kilometers through community farmland all the way from Imenti forest! The elephants then broke out of the corridor in the same spot only to return later and head downhill towards the Ngare Ndare Forest Reserve. When the rains arrived in mid October more work started with the spraying and cutting of fresh growth along the fence lines. Late October saw a truck break the wires at the D481 road crossing, quickly fixed by fencing teams. The Rhino Ark Fence project has moved its base to the Kiamweri outpost of the Ruthumbi forest station with construction work complete on the southward stretch of 4.5km from Ruthumbi forest station. Although the fence is rapidly moving around the boundary, different areas uproot different issues. For example, the fence has been halted along the Nthunguru forest area due to KFS issues with an individual who has planted tea on concessional plots on the forest boundary. Rhino Ark and its partners including Mount Kenya Trust, KWS and KFS work the problems out with the stakeholders in the areas as they move along. The process highlights the issues and enables a just solution which helps to put the community at the center of the resolution. 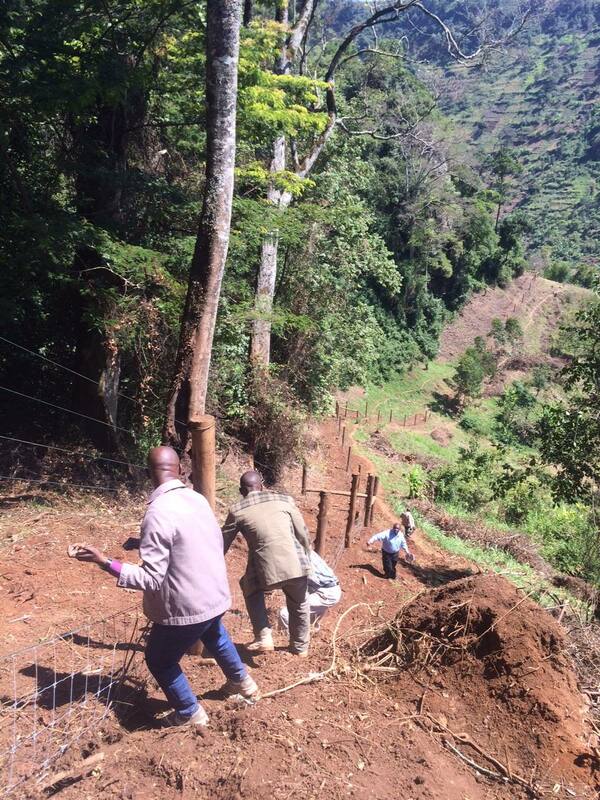 So far, over 100km of fence has been completed. The Trust held several meetings and a two day workshop put together a 5 year Strategic Plan. The plan will be finalised before the end of January. We are indebted to Nancy Balfour for leading us through this process and taking the time to draft our new Strategic Plan. 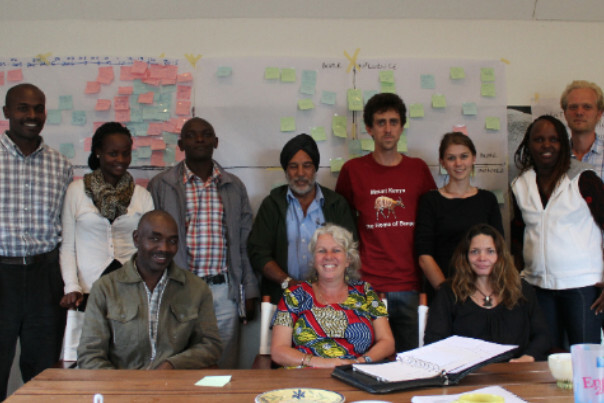 The photo shows the team that participated in the two day workshop in November. 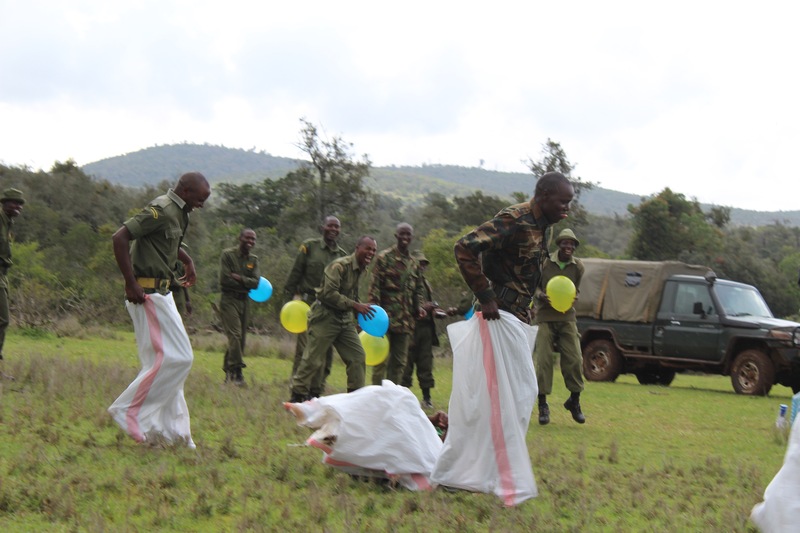 SMART training and our teams photo competition prize giving were combined with team building fun and games in the Ngare Ndare Forest in mid December. We were joined by the Ngare Ndare Forest Trust Scouts and are grateful to the NNFT for the use of of their beautiful campsite. Parting Shot - Protecting all four-legged fritters! 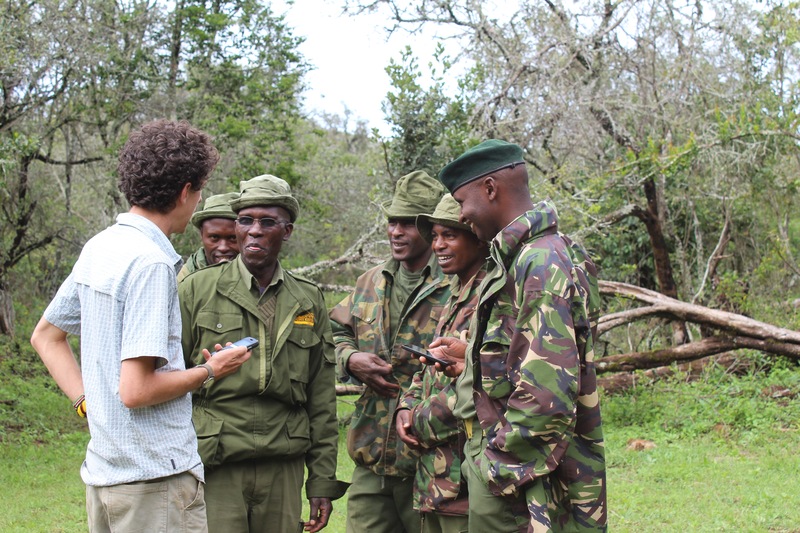 Eden Wildlife Trust, Safaricom Foundation. Jeremy and Claire Evans, The International Elephant Foundation, African Fund for Endangered Wildlife. Safarilink, Susannah Rouse, Jim Butterfield, Finlays Farm, Steve and Robin Sapiro, Lewa Wildlife Conservancy, Friends of Africa International, Kisima Farm, Marania Farm, Kevin Pyper, Rebecca Brooke. Thanks to our regular contributors for their assistance so far this year: The Mountain Club of Kenya, Ol Donyo Farm, Steve Strong, Dom & Melissa Weeks. Marania Farm, Tropic Air,Borana Conservancy and Lewa Wildlife Conservancy. Nancy Balfour we are so grateful for your help with the new MKT Strategic Plan thank you!! Thanks again to Morten Jensen for his voluntary time working on the Trust's financial reporting for the Finance Committee. THANK YOU Cielle Vaughan for your month of work experience up at the Horse Patrol Team - helping the team to adopt SMART and teaching newest member Gabriel how to ride. Good luck with the rest of your year and University! A big thank you to Jorien Schuurmans for all your work with the Community Health Project so far. Photos: Mount Kenya Trust teams, Kelly Wellman, Peter Coleridge, Henry Gibbon. 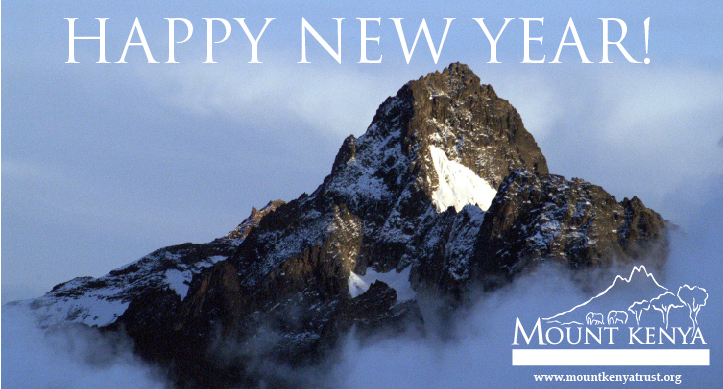 Copyright Â© 2014 Mount Kenya Trust. All rights reserved.